The National Institute of Anthropology and History (INAH) restored a unique niche in its class in the state of Campeche. The altarpiece of the colonial era is in the courtyard of the Church of San Roque and has religious representations, presumably was made by the order of the Franciscans and serves as an area of ​​cultural expression. This mural painting is the only one that is conserved in the state and exposed outdoors, it is one of the scarce references of the eighteenth-century mural painting that still somehow intact. It is completely ornamental, in fact, you see that the bottom is phytomorphic, that is to say of different flowers and the roof makes reference to the sun that alludes to the Franciscan religion “, explained Leticia Jiménez Hernández, restorer of the INAH in Campeche. This painting was made with the tempera technique, a painting technique in which the solvent of the pigment is water and the binder or thickener is some type of animal fat, such as glycerin or egg. Historically, tempera painting is characteristic of the European Middle Ages. It can be considered characteristic of the Romanesque and Gothic styles in Western Europe, and of the Byzantine and Orthodox cultures in Eastern Europe. 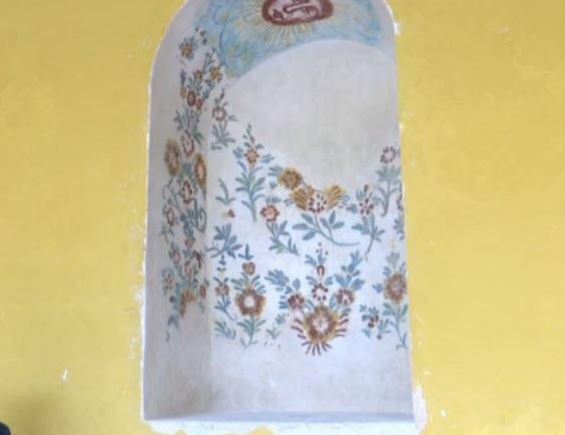 “We realized that the painting had inadequate interventions in the fact that missing patterns have been replaced or covered with white cement (covering part of the original decoration), so we had to these problems of “stability”, that is to say, disintegration of the original material,” said Leticia Jiménez Hernández, restorer of INAH in Campeche. The Solomonic style niche was made between the years 1,700 to 1,800 and was found accidentally in the year 1990 while carrying out construction works.